What Can You Do For Love ????? 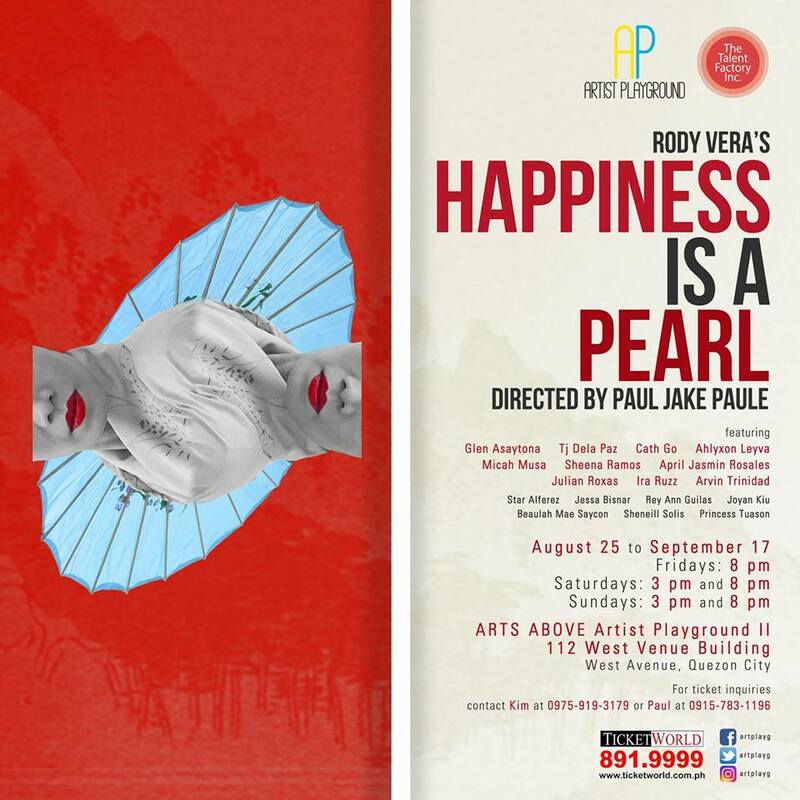 Winner of Best Non-Musical Production (Aliw Awards 2016) and Best Filipino Play – New / Revival (Broadway World Awards 2016), “Happiness is a Pearl” is all set to open tonight and shall run up to Sept. 17 at Arts Above, Artist Playground II, 112 West Venue Bldg., West Avenue, Quezon City. “Happiness is a Pearl” revolves around three characters ---Kenji, a male courtesan; Maria, a poor Pinay Japayuki; and Mari, a wife who falls in love with Kenji. “Happiness is a Pearl” will be directed by Paul Jake Paule, an esteemed actor, director and Aliw Awards nominee. For tonight, the three major roles will be portrayed by Arvin Trinidad as Kenji, Micah Musa as Mari and Sheena Ramos as Maria. The ensemble is as follows: Star Alferez, Jessa Bisnar, Rey Ann Guilas, Joyan Kiu, Beaulah Mae Saycon, Sheneill Solis and Princess Tuason. The Artistic Team is led by Paul Jake Paule (Director), Roeder Camañag (Artistic Director), Jesse Lucas (Music By), Lezlie Dailisan (Choreographer) Mailes Kanapi (Artistic Consultant) Jeffrey Camañag (Production Design Consultant) Ma Fatima Cadiz (Assistant Director) John Mark Yap (Lay-out Designer) Aly Mondonedo (Photographer) Sem Pabion (Dramaturg) Rowena Jarito(Sound Designer), Glenn Caspe(Lights Designer) and Reynoso Mercado (Production Designer). The Production Team is led by Kimberly Claire Somoza (Production Manager) , Joselito “Toots” Tolentino (Publicist) Pat Gajes (Stage Manager), Jeremy Cabansag (Deputy Stage Manager), Arjie Rebuldela (ASM for Lights/Boardman) , Beaulah Mae Saycon (ASM for Costume), Star Alferez (Costume Mistress), Jessa Bisnar (Make-up Supervisor), Rey Ann Guilas (Prop head), Rowena jarito(Spinner) , and Set team : Glenn Caspe, Jayson Garcia, Paul Candor and Joyan Kiu. “Happiness is a Pearl” had its premier performances last July – August 2016 at 1701 The Little Room Upstairs in Timog Avenue QC. Last November 2016, the same production was featured at the opening of the Maybank Performing Arts Center in Bonifacio Global City.